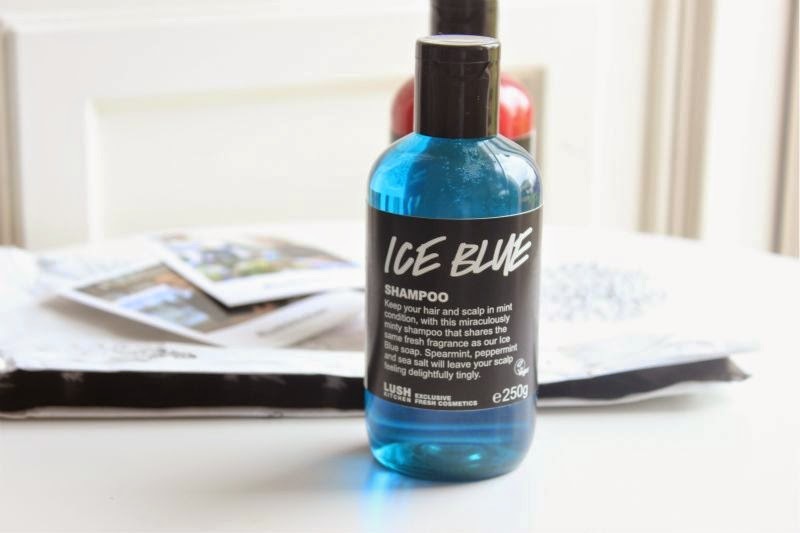 I wasn't going to do a full review of Lush Ice Blue Shampoo as it is super limited edition and only available via the Lush Kitchen but after all it has done for my scalp and the fact it is still in stock, I though why not? If I can help one person rid themselves easily of an itchy irritated scalp I will be happy! Here in the UK the weather has been warm, not always sunny but warm and muggy and as a result my scalp has really been playing up. I have been shedding hair much like my cats (eww human moulting), after a trip to the doctors to ensure it wasn't something a little more serious (apparently like animals we shed hair seasonally too). The humid heat of the last two weeks has also resulted in an itchy scalp so with that in mind I set out to find a soothing but invigorating shampoo. To know me is to know that I am a Lush fiend so it only made sense it was my first port of call. Luck would just so have it that the Lush Kitchen have just cooked up a fresh batch of Lush Ice Blue Shampoo. This shampoo deeply cleanses and soothes the scalp from the first wash, it doesn't strip the scalp nor does it leave the hair feeling dry. Not only does the Ice Blue shampoo share the same fresh fragrance (seriously minty) as the Ice Blue soap but it contains menthol which is great for the scalp. It can help to combat hair loss by stimulating and boosting the scalps circulation which in turn will encourage hair growth. It is one of those shampoos that removes all build up on the scalp be it product, dirt, sweat or a combination with next to no effort. I was my hair every third day and have found that my scalp is no longer itchy, the hair shedding is still present and apparently will be until late August but sometimes you simply can't fight nature! Oh and also this shampoo is made with sea salt so if you're hot (or in a tropical clime) this will cool and soothe your scalp down naturally. I have also found that the sea salt addition has given my hair a new lease of life, it feels soft yet is so bouncy. If Lush could make this shampoo permanent that would be just great. At the moment you can find it via the Lush Kitchen -here but I warn it won't be around for long!